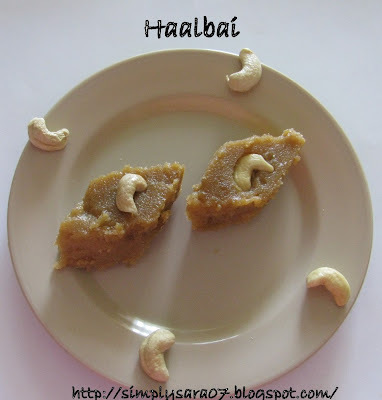 Haalbai is a halwa made with rice, coconut and jaggery. Its a famous sweet in Karnataka, India. This is very simple and tasty. I made this for Deepavali. Soak rice for about 2 hours in water. Take jaggery and add little water and keep aside. Grind rice in Mixie or blender to fine paste then add grated coconut and cardamom powder. Grind all to a fine paste. Heat a kadai, add 2tspns ghee put the mixture and jaggery. Keep stirring continuously without leaving in low-medium heat. Then add balance ghee and stir till its soft and thick. Grease a plate with ghee and pour this and level it like other sweets. Allow it to cool(You can also keep in fridge for sometime)then cut into desired shapes. Haalbai sweet halwa is ready. Looks perfect. I still remember my first attempt at making carrot halwa and yes, it was a disaster. Content wise you're doing fine, but a little more background about the dish would enhance the quality of the blog. Wow this halwa looks marvellous, we do something similar...yumm! Hi Akshay thank you for the comments surely will add more info. Hi Priya and Shama, Thanks you for your comments. Super taste, this looks very easy to prepare. Thanks dear to make my saturday busy. Hi. Nice version of halwa. Halwa looks wonderful very festive! thanks dear i could tweak your recipe a little refer to gollbhai post of mine. And great I could get bak few memories for my husband and mom-in-law. 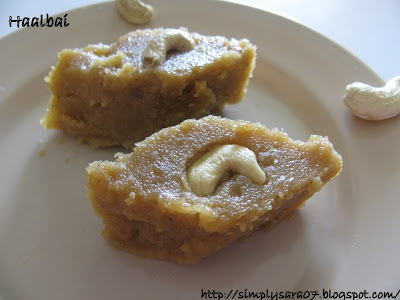 Halwa, is extremely soft and great and it gave me a good learning experience. Thank you friends for your lovely comments. Thanks Hema for trying. Saw ur entry in Divya's Ghee round up.Nice recipe.I do it with wheat flour.